As I outlined in Part II of this series, the electoral college was an ingenious compromise designed to preserve both the concepts of federalism and republicanism in the selection process for our president and vice-president. The intent was also to avoid the polarization by political parties by having non-committed electors select the best qualified individuals for these two offices. Unfortunately, this ideal only lasted for the first few election cycles. It didn’t take long before political parties arose, and with them the bitter factionalism they tend to produce. This became evident in the election of 1800 in which the incumbent, John Adams (representing the Federalist Party) was opposed and defeated by Thomas Jefferson (representing the Democratic-Republican Party). The Federalists favored a strong central government whereas the Democratic-Republican Party favored a smaller, limited central government with the states holding most of the governmental power (sound familiar?). By 1836 the two party system was well-established and several trends towards the system we see today had begun to emerge. One was the popular selection of the electors by all states (with the exception of South Carolina). With the move to state-wide popular vote for the electors came the “winner-take-all” approach to awarding all of the state’s electors to the candidate who won the popular vote. In 1831 the first truly “third party”, the Anti-Masonic Party, held the first presidential nominating convention in Baltimore where they selected not only their candidate for president, but also his “running mate” for the office of vice-president. The other major parties eventually followed suit, and from there it evolved to where the electors became tied to the candidates of their parties. This became more ingrained over the years until we finally ended up with our current method in the electoral selection process. The uproar we’ve heard over the past couple of elections regarding one candidate winning the popular vote and losing the presidency in the electoral college is nothing new. There have been three instances in our history in which this has happened. In 1876 Democrat Samuel Tilden won the popular vote but lost the electoral vote to Republican Rutherford Hayes. In 1888, again the Democrat candidate, Grover Cleveland, won the popular vote yet lost to Republican Benjamin Harrison in the electoral college. Then in 2000 Democrat Al Gore lost the presidency to Republican George W. Bush in the electoral vote despite having a narrow margin in the popular vote. 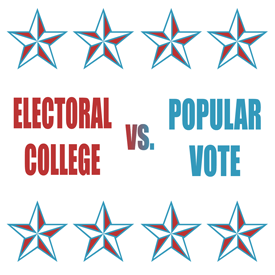 There have been other instances in which the winner in both categories had a narrow majority in the popular vote but a significant margin in the electoral college. So, controversy over our process is nothing new. Next week we’ll examine the advantages of the electoral college system over that of direct popular vote. In Part I of this series I pointed out that although some of the founders felt the people could be trusted in the direct election of the executive officers, most did not. During the Constitutional Convention of 1787, many ideas were floated as to how to effect their election. Another suggestion was to have the executives of the states select the president. It was argued that they would be more acquainted with the traits a “chief executive” would need as they themselves functioned to a lesser degree in that same capacity. This was rejected as it failed the test of “republicanism” – i.e., the people would be too far removed from the process. The final compromise that we find in Article II Section 1 of the Constitution was to have the state legislatures select “electors” from among their citizens who would in turn vote for the president and vice-president. It was left up to the states to determine the method by which their electors would be chosen, including allowing the people to select them by popular vote (which five states – New Hampshire, Virginia, Delaware, Maryland and Pennsylvania – did in the very first election in which George Washington was chosen President). These electors were not like those appointed to this task today. They were individuals chosen based upon their maturity and wisdom in the affairs of the nation who would be of a character whose interest was what was best for the country. They were to be individuals who would have the ability to vet those whom they felt were noble candidates for these offices and select the one they felt was best qualified. Consequently these electors were not part of a political party’s “slate of electors”, nor were they “pledged” to a particular candidate as they are today. They were to be completely independent and thus able to make a choice based upon the qualifications of those considered for the executive offices. In Part III I’ll examine how we went from this ideal to what we have today. When you read the ninth and tenth amendments, at first blush the ninth seems to be irrelevant because the same point appears to be repeated in the ending of the tenth. However, upon closer examination, the ninth is as important, if not more so, than the tenth. As you can see, Hamilton’s argument is one of exclusion or silence. To state that the government cannot do something implies that without that prohibition it would be authorized or empowered to do so. But, if there is no prohibition stated, it is understood that no authority or power in that area exists to begin with. However, the Anti-Federalists opposed the ratification of the Constitution unless there was a guarantee that a bill of rights would be added to the newly minted constitution upon the convening of the first congress, and so in that first congress James Madison pressed the Federalists who controlled it to follow through on that guarantee and send to the states for ratification what we now know as our Bill of Rights. This brings us to the language of the amendment in question. The ninth amendment addresses “rights”, whereas the tenth deals with the delegation of “powers” – two very different concepts. The purpose of the ninth amendment is to shore up what Hamilton warned of in his Federalist essay, namely that just because not every right was specifically enumerated within the Constitution, it did not mean that the people had forfeited them to the control of the central government. It is a “catch-all” amendment prohibiting the general government from assuming control over rights which the people had never intended to delegate to it. Since the ninth amendment addresses “rights” over which no man or entity has the leeway to usurp, it is even more critical than the tenth. 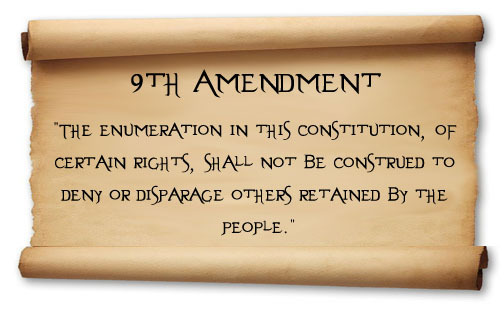 We hear much trumpeting of the tenth amendment today, and rightfully so, but it is imperative that we also understand the even greater significance of the ninth and that we, the people, reassert our claim to it in the face of a government which violates it at every turn.